Amateur beauticians with no medical training are offering to inject schoolgirls with dangerous lip fillers for as little as £59, the Daily Mail reveals today. Insecure young women are being targeted on social media and encouraged to have their lips injected to enhance their looks. But the cosmetic treatments – which may be carried out in back rooms of hair salons and in customers’ living rooms – can cause irreversible damage. 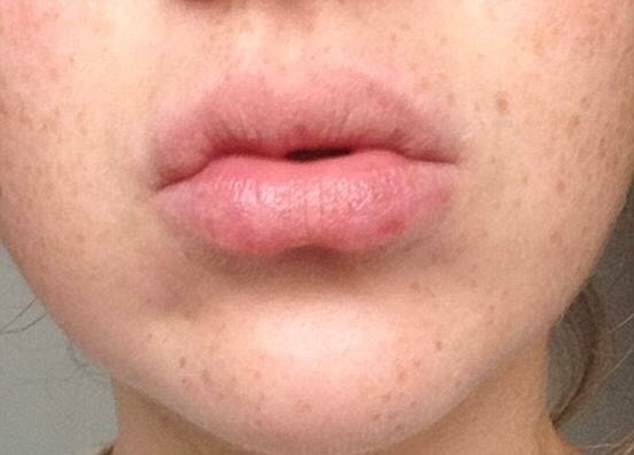 Lip filler treatments, which involve people having their lips injected with acid, can lead to extreme swelling, infections and allergic reactions. 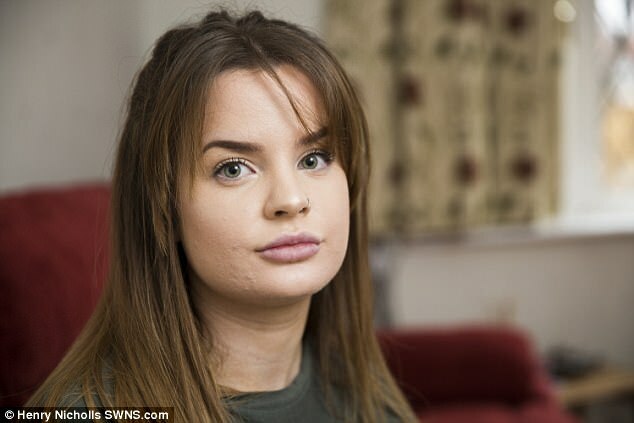 Undercover reporters from the Daily Mail accompanied 17-year-old college student Ellie Ducker while she visited amateur lip filler practitioners who advertise online. One of them represents himself as a doctor but is not registered with the General Medical Council. An official Government review four years ago warned the growth of unregulated filler treatments was ‘a crisis waiting to happen’. It called for a change in the law to protect vulnerable young women – but this has not happened. Other beauticians the Mail found online offer special deals, including the chance to cut costs by sharing a syringe with a friend. The growing cosmetic industry is worth an estimated £3.6billion. Nine out of ten procedures are non-surgical, such as Botox and fillers, and these are not regulated. Anyone can set themselves up as a lip filler practitioner – even if they have had no training or previous experience. As a result, young women are increasingly being targeted online by amateurs advertising lip filler treatments on Facebook, Twitter and Instagram. They offer deals for as little as £59. Other beauticians offer special deals, including the chance to cut costs by sharing a syringe with a friend. One wrote on Facebook: ‘For a full syringe of lip fillers £240 but can share with a friend and pay half the price each (with different needles obviously). Lip filler ‘parties’ are also advertised, where girls can be injected together in their own homes. Daily Mail reporters visited three practitioners with a girl of 17. One beautician spoke about having had two days of training. None of them had any concerns about injecting the college student’s lips. They all tried to convince her to have the treatments after she said she was too scared. Fillers can cause severe and prolonged swelling, bruising, lumps and necrosis, when the lip tissue dies and goes black. Those who suffer often then have to pay about four times the original price to have botched fillers corrected by a doctor. Campaign group Save Face raises awareness about the dangers of non-surgical cosmetic treatment and compiles a register of accredited practitioners, which is approved by the Government. ‘There are some people out there who set up a social media page, get clients, something goes wrong, they shut down the page and they open up under a different name. It goes on and on. The British Association of Aesthetic Surgeons found 40 per cent of surgeons have seen problems with unregulated facial filler. The Department of Health said traders were required by law to carry out a service with reasonable care and skill. Ministers were warned four years ago that the industry was ‘a crisis waiting to happen’. In an official review in 2013, NHS medical director Sir Bruce Keogh found the industry was ‘almost entirely unregulated’. Sir Bruce’s investigation reported that patients have ‘no more protection and redress than someone buying a ballpoint pen or a toothbrush’. He called for new laws to make fillers only available on prescription to protect young women. But the warnings were all but ignored by the Government and anyone can still perform lip filler injections with no qualifications or training. 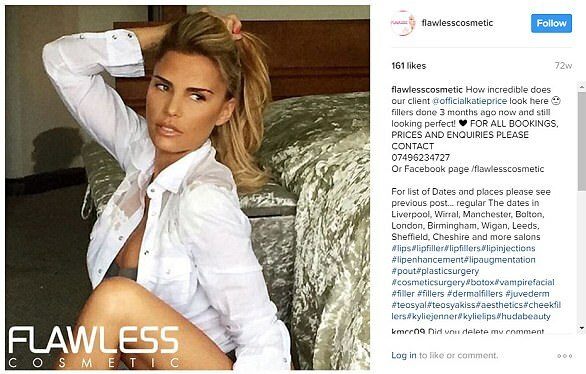 Young women are being targeted on social media by beauticians who convince them to have lip filler treatments. They are given the impression that having fillers will make them look like their favourite celebrities. Holly Spedding, who has more than 60,000 followers on Instagram, advertises by using pictures of Katie Price and American reality TV star Kylie Jenner. Miss Spedding’s company Flawless Cosmetic posted a picture on Instagram of Miss Jenner when she was 17 and announced she had her lips treated. Miss Spedding offers free 1ml lip fillers or £100 gift vouchers to those who share her page with friends. The booking process is made as easy as possible for those who might be nervous about going ahead with the procedure. Once on Miss Spedding’s social media page, they simply have to click call or text a number to arrange an appointment. They are then sent a text with a list of dates and locations to choose from. The text explains that the procedure takes just 20 minutes, adding: ‘You could get it done in your lunch break.’ The messages do not ask for any proof of age or identity. Last night, Instagram, Twitter and Facebook declined to comment. Miss Price declined to comment. the suggestion that she actively seeks business from young girls ‘is entirely without foundation’. As a healthy girl of 17, college student Ellie Ducker clearly does not need cosmetic enhancements. But beauticians tried to convince her she needed lip fillers. Ellie travelled the UK with undercover Mail reporters and signed up for treatments with three practitioners. She attended the appointments but backed out, saying she was too scared. One of the appointments was with Golam Chowdhury, who runs a clinic in Birmingham and represents himself as a doctor but is not registered with the GMC. When Ellie arrived, she was asked for ID, which shows she is 17. But no comment was made about her age. Mr Chowdhury was happy to inject her lips. Beautician Emma Walshaw visited Ellie a few weeks later in Uttoxeter, Staffordshire. She told Ellie she had done two days of training. Another beautician, Holly Spedding, tried to convince Ellie to have her lips injected after she said she was too scared to proceed. ‘You’ll kick yourself, you’ll regret it as soon as you get home,’ she said. All three practitioners recommended at least 1ml of filler, even though doctors who spoke to the Mail said half this amount is enough for a natural look. Beautician Holly Spedding tried to convince Ellie to have lip fillers – even after the teenager said she was too scared. Ellie met Miss Spedding, 29, on a Friday in January at the Weaves and Waves salon in Wigan, Greater Manchester. She arranged the appointment by text message, contacting a phone number advertised on an Instagram page. The text message specified ‘over 18s only!! !’ When Ellie arrived at the salon she was asked to write down her date of birth – which she adapted to suggest she was 18. But she was not asked for proof of age. Customers had numbing cream applied to their lips by a receptionist in a communal area where people were having beauty treatments, such as hair extensions. During the appointment, Miss Spedding briefly talked Ellie through the procedure and aftercare, advising her that she would need at least 1ml of filler. ‘Most people who say they’re too scared on the day end up going home, regretting that you didn’t get it done and then you work yourself up for it even more that it becomes a big thing. ‘never knowingly treated anyone under 18, with or without their parents’ permission’. The spokesman said Miss Spedding has NVQ Qualifications in Beauty Therapy Levels 2 and 3 and has completed courses in dermal fillers. He said 1ml is ‘the standard amount for most procedures, which produces a subtle look’. Weaves and Waves did not respond to requests for comment. Emma Walshaw spoke about having two days of training in giving fillers – and held a syringe in her hands without gloves when she met Ellie. The 37-year-old beautician, who visits people’s homes to carry out her work, saw Ellie at 2pm on a Sunday in February at a house in Uttoxeter. The appointment was arranged through Facebook and Ellie was asked to transfer a £30 deposit into Miss Walshaw’s bank account beforehand. On arrival, Miss Walshaw sat next to Ellie on the sofa and produced a syringe from her handbag with her bare hands. She asked Ellie to sign a consent form, which required just a signature and date. At no point was Ellie asked about her age or to produce ID. When Ellie said she was not sure how much filler to have, Miss Walshaw told her that 1ml ‘isn’t a lot’ and would not make a ‘massive’ difference. Miss Walshaw, who also tattoos eyebrows, told Ellie she had completed a two-day training course in Manchester. ‘People say “Are you a nurse?” But you don’t have to be a nurse. I’m beauty-trained,’ she added. When Ellie said she was too scared to have the injections, Miss Walshaw laughed and repeatedly tried to persuade her to go ahead. She insisted that ‘it’s not that bad’ and that it would be over in ‘five minutes’. Miss Walshaw then offered to insert the needle into Ellie’s lips without any filler, to see if she could ‘deal with’ the pain. Ellie refused and said she could not go ahead. Last night, Miss Walshaw declined to comment. Ellie arrived for an appointment at the Arcadia Care Clinic in Birmingham on a Wednesday night in January, and was asked to give ID to a receptionist. The clinic offers a £59 ‘lip plump’ deal online. Ellie also filled in a form with her date of birth – showing she is 17 – but staff gave no indication this was a problem. 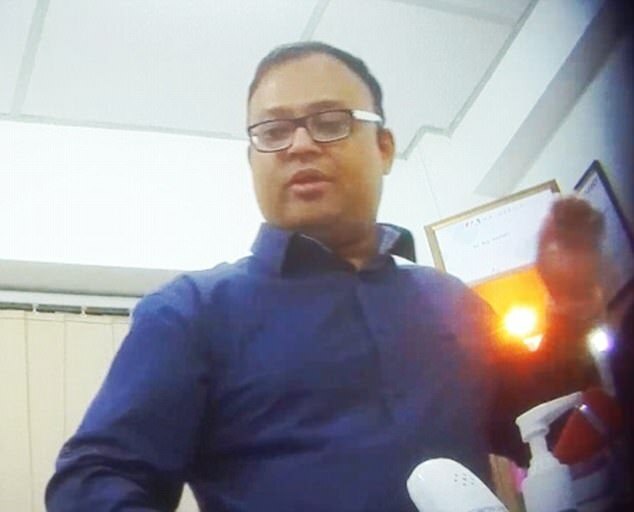 They took her into a back room for treatment with the clinic’s director, Golam Chowdhury, 41, who refers to himself as a doctor, and his wife Rizwana, 37. The GMC confirmed that Mr Chowdhury is not on the medical register. It has now written to him to warn that he must make it clear that he is not seeing anyone in a medical capacity, otherwise he could be breaking the law. Mr and Mrs Chowdhury did not respond to requests for comment. Claire Hawkins’s lips swelled terribly and went black after treatments by beauticians. The 24-year-old’s face looked so bad, her mother thought she had been beaten up. She had corrective treatment by a cosmetic doctor. The whole process cost £1,500. Miss Hawkins, an administrator from Yeovil, Somerset, decided she wanted fillers when she was 21 after feeling insecure about the way she looked. In the months that followed, she had doses injected by beauticians in her hometown. During one appointment at a friend’s house in May 2015, she was injected with 1ml of filler. Her lips swelled, but they eventually appeared to settle down. Miss Hawkins then arranged another appointment two months later at a beautician’s home in north London. She was injected with 1.5ml of filler, costing £360. But shockingly, Miss Hawkins’s mouth quickly began to swell. ‘I could taste blood,’ she said. In the hours that followed, she began to suffer what appeared to be symptoms associated with necrosis. She also developed pea-sized lumps in her mouth. The bruising went down but in the year that followed, she noticed her lips had become uneven and lumpy. So she visited cosmetic doctor Beatriz Molina, who told her the filler had been injected in the wrong place. Laura Meachem had lip filler treatment in the tiny back room of a salon in Birmingham. The 24-year-old beauty blogger wanted a ‘subtle, natural enhancement’ to her looks and thought the procedure carried no risk. But after arriving for the treatment, she was led to a room under a staircase. She was treated by beauty therapist Holly Spedding. Miss Meachem believes the appointment took five minutes. She was then asked for £230. Last night Dr Esho said: ‘Unfortunately, Laura was actually waiting to see me for lip fillers. ‘Then it turned out there was a six to eight month waiting list, so she saw this person’s work on Instagram and decided to ahead with it. I felt so bad when she told me her story. ‘When we did the dissolving process, she had an allergic reaction. I can deal with allergic reactions, I’m a trained doctor. He added that the accessibility of dermal filers is ‘disturbing’ and ‘shocking’.